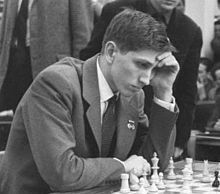 Bobby Fischer, e 1960 e Leipzig. Robert "Bobby" James Fischer a zo bet ganet d'an 9 a viz Meurzh 1943 e Chicago (SUA) ha marvet d'ar 17 a viz Genver 2008 e Reykjavik (Island). Mestrc'hoarier echedoù eus SUA deut da vout islandat e 2005. Da c'hwec'h vloaz e teskas c'hoari. An niveroù a dalv ar poentoù bet tapet gantañ diwar niver ar poentoù posupl. 1957-1958: 10.5/13 (Kampion SUA e miz Genver 1958 a-raok bout pemzek vloaz). Ne gemeras ket perzh e Kampionad 1961-1962. Ne voe ket a gampionad e 1964-1965. Kampion ar bed e voe e 1972. Bobby Fischer, My 61 memorable games. Edward G. Winter, World Chess Champions, 1981, ISBN 0-08-024094-1. World Champion Fischer (ChessBase, CD-ROM) - includes all Fischer's games (around half annotated), biographical notes, and an examination by Robert Hübner of Fischer's annotations in My Sixty Memorable Games. Bobby Fischer a-enep da Boris Spassky, Kampionad ar bed 1972, c'hwec'hvet partienn ag ar match, 1-0. Kemmoù diwezhañ degaset d'ar bajenn-mañ d'an 30 Ebr 2016, da 11:14.